Eric Gill, active in the British Arts and Crafts movement, trained in architecture before realizing his true passion lay in lettering. He studied writing and illumination at the Central School for Arts & Crafts, London, and worked as a sculptor, typographer, illustrator and stone carver. Gill designed many fonts still in use today, most notably Gill Sans (1927-1930) and Perpetua (1929). He influenced the next generation of British stone carvers and letter cutters through his work and teachings, and established an informal Arts and Crafts community in Ditchling Common, England. 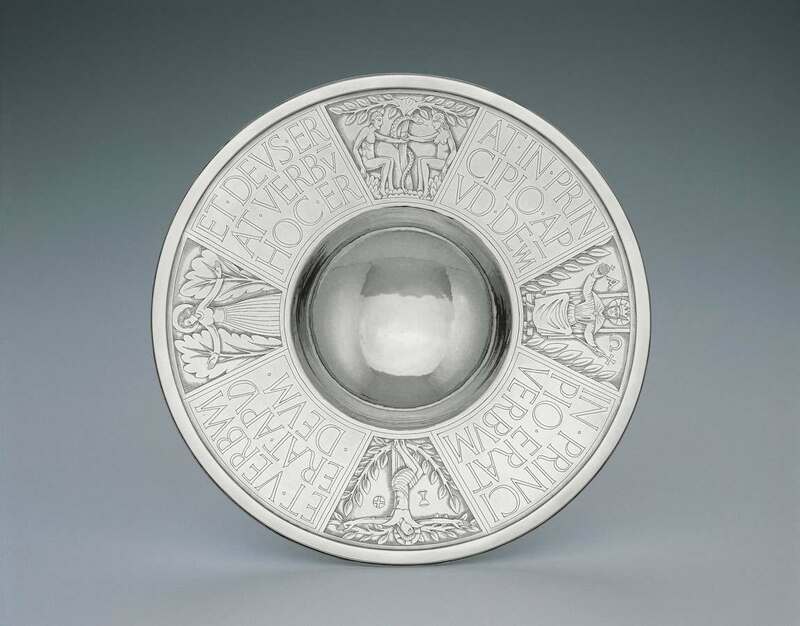 A Catholic convert in 1913, Gill imbued this Alms Dish with his strong faith. As the plate attests, his later work became increasingly involved with religious themes. Although a traditional object, the plate’s design exhibits a modern sensibility with flattened forms represented by a minimal amount of modeling and line while depicting scenes from the Old and New Testament. George Booth purchased this work for the Museum’s collection from the American Federation of the Arts’ “Third International Exhibition of Contemporary Industrial Arts” in 1930.